Having landed a major musical franchise deal in 2015 with the rights to create a Guns ‘N’ Roses themed-slot, NetEnt would have been forgiven for sitting back and enjoying the fruits of their labor. But they didn’t - instead they embarked on landing another deal with an equally popular and influential artist – Jimi Hendrix. Widely regarded as the most creative and experimental musicians of the 20th century, James Marshall Hendrix (Jimi Hendrix) took performing with an electric guitar to all new levels. Never before had a musician combined feedback, fuzz and controlled distortion in such a way to captivate audiences, propelling him to global-stardom. Jimi Hendrix sadly died at the tender age of 27, yet left a legacy of music that lives on and is enjoyed globally by millions of fans. NetEnt has used a fairly standard 5 reel, 20 payline format for the Jimi Hendrix slot. At first glance the pastel colors and hand-drawn floral design looks a little basic. But as you start playing more and more you are drawn into the game that certainly captures the psychedelic era Hendrix lived in. The softer colors also allow for a longer playing session, as your eyes don’t have to work as hard as they do with brighter colors found in many other online slots. Possibly the most enjoyable thing to accompany the Jimi Hendrix slot is the soundtrack, which includes some of his most famous tracks such as “Foxy Lady,” “Purple Haze,” “Crosstown Traffic” and “Little Wing”. They play away in the background as you spin the reels, reminding you of how great Hendrix was. Purple Haze feature – This simple feature requires just 1 Purple Haze symbol appearing on the 1st reel. This will transform all A-K-Q-J-10 to Wilds on the following spin. Red Guitar Re-spin – Land 4 or more Red Guitar symbols during the main game and you activate a re-spin. If more Red Guitar symbols appear then the reels with re-spin again and continue until no more appear. 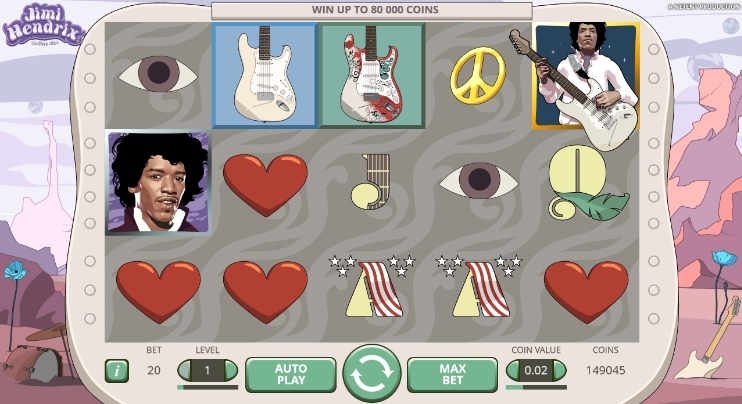 Pick and Click feature – This feature is activated when you land the Jimi Hendrix scatter symbol on reels 3, 4 and 5 at the same time. You are then presented with a selection of loudspeakers where you pick to reveal your feature. You will either win Crosstown Traffic Free Spins, Purple Haze Free Spins, Little Wings Free Spins or Coin win. Crosstown Traffic Free Spins – You get 6 free spins with Wilds appearing on the last reel on the 1st spin and then gradually working their way to the first reel as you progress through the feature. Purple Haze Free Spins – You are awarded between 6-12 free spins in this feature. 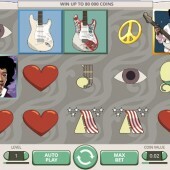 As with the Purple Haze feature in the main game, the symbols A-K-Q-J-10 turn wild during the free spins. Little Wings Free Spins – Get between 6-12 free spins and during the feature you will be awarded with 3 and 5 overlay Wilds which appear randomly on the reels during each spin. Coin Win – You are simply awarded between 8x – 30x your stake. It’s hard not to like anything that has been made to celebrate the life and music of Jimi Hendrix. Despite it being a fairly low volatility slot, I have enjoyed playing the Hendrix slot for several long sessions. The music, the soft graphics and the psychedelic nature of the game does make it a lot of fun. However, regular slots players will find that the lack of big wins may lead you back to your favorite slots. If you like music-themed slots then you may want to check out the WMS slot KISS (based on the rock band of the same name).